Friends describe you as more chill than clean. 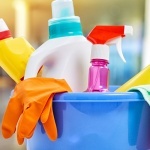 Scrubbing is right down at the bottom of your to-do list (just like your cleaning supplies are right down at the bottom of your cupboard). But despite all that you still prefer to have a neat abode. If you thought that there are no quick fixes to cut corners with your cleaning routine and still get a super hygienic house, think again! Try these once and you’ll find yourself using them for life. Not just the drink of choice in Russia, vodka works wonders on smelly soft furnishings like your sofa and mattress. Spritz it on, wait for it to dry and bacteria and bad odours will be eliminated. Got a gap between your kitchen worktops and your appliances that food scraps always fall into? Insert plastic tubing (that you can pick up from DIY shops) into the gap. Problem solved. There’s an art to dusting; you just need your paint roller. Wrap a microfiber cloth or some masking tape sticky side up around the roller to easily clean dusty light fittings and hard to reach cobwebs. School assembly halls wouldn’t be complete without numerous scuff marks from all the rubber-soled shoes. If you’ve got the same problem at home, remove the marks easily with a tennis ball. Job Wimble-done. You should never use cotton buds in the crevices in your ears, but the crevices of your furniture are fair game. Dust and stubborn dirt be gone! 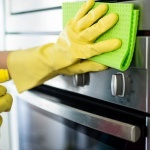 Whenever you’re cleaning with a sponge or damp cloth, just pop it in the microwave for a few seconds. A warm cloth will cut through more grease with much less elbow grease. What kind of zany contraption could hope to clean slatted blinds or bathroom radiators? You don’t have to look too far; you’ve already got one in your kitchen drawer. Tongs wrapped in cloths are the super simple solution. Appliances deserve to sparkle too! What’s that smell? Over time, a grease-clogged filter will stop your cooker hood from removing smoke and odours. Boiling water with half a cup of baking powder in it creates the perfect cleaner to leave your filter gleaming. Note: This only works for metal filters, disposable filters will need replacing periodically. Don’t just sit there like a lemon! Microwave some lemon slices in water to steam any burnt food splashes off the inside of your microwave. Keep an eye on your iron. Burnt on starch or gunk from synthetic fabrics will need shifting straight away to avoid marking your clothes. All you need is a warm iron and a cloth soaked in vinegar and baking powder to do the job. For kitchen surfaces clean enough to eat off! A little bit of clean gravel (like the kind you can get for the bottom of fish tanks) is perfect for glass cleaning. Pop a handful of gravel along with some warm water into the bottom of a glass jug or vase, swirl and see the shine! Grubby grout making you grumpy? Whiten old grout with a bleach cleaning gel, worked in with a washing up brush, to instantly improve the appearance of your whole kitchen. Sometimes glasses can get cloudy, especially in dishwashers and hard water areas. A spot of vinegar will turn that cloud into a beautiful shine. Now you may have the daintiest hands in the world, but we’re almost certain you can’t fit them into a champagne glass. No one can. So grab a pair of chopsticks instead to move your sponge around and give your flutes a thorough wash. Bored with the task of scrubbing your chopping board? Sprinkle it with salt and rub with half a lemon to shift unsightly stains. Bathe in the wonderful environment that is your spotless bathroom. Once dollops of shower gel or hair products have dried onto your bath or shower, they don’t shift easily. Luckily, with the help of your bathroom razor, you can remove them with a flick of the wrist. Blades are expensive so probably best to use old ones for this tip. Get your teeth into this shortcut. Before binning your old electric toothbrush, squirt a bit of toothpaste on it and brush all around your sink taps and plug to get grime out of the crevices. Wipe clean and see your sparkling smile reflected back at you. Car enthusiasts will be familiar with water repellent spray for window glass, but did you know the same product works wonders on shower glass too? Spray it on clean glass and your shower will sparkle for much longer between cleans. Dirty toilet making you flush with embarrassment? The water jets around the rim of your latrine can get mouldy and mucky, but a hand mirror and toilet brush are all you need to see and remove the dirt. Our solution to the common problem of greasy soap scum in the bathtub? A wipe down with washing up liquid and warm water – couldn’t be simpler! Our final bonus tip can also be used to clean smarter not harder; get yourself a steam cleaner! You can use it to cut out the effort involved with all sorts of cleaning chores (without having to use a single nasty cleaning chemical).